I went to see it last night and it’s sweet – although I suspect the budget was largely spent on the CGI animals, as opposed to the script. Don’t go expecting the songs either, because they’ve largely been cut out. But Bill Murray as Baloo (the bear) is quite jols, and my friend SIR Ben Kingsley is v wry as Bagheera (the panther). Plus Idris Khan does the voice of Shere Khan and is still pretty hot as a tiger. That’s not weird, is it? Anyway, it reminded me that I had this photograph of me as Bagheera kicking about somewhere, so I just found it on Facebook. 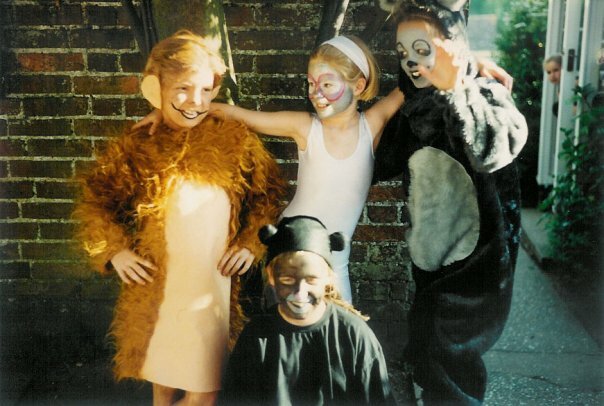 That’s me in the middle as Bagheera with my felt hat on, I must have been about eight or nine. I normally had to be the boring old husband in school plays because I was tall, so being a panther marked a new era in my acting career. My brother Drum was one of the elephants, and Mum made him a trunk using a pair of grey tights stuffed with cardboard loo rolls. New tights, I’m pretty sure, because he had to wear the gusset over his face.